Some of you might know how the “Grand Sport” name for the Chevrolet Corvette. If you don’t, let me explain. In 1963, Zora Arkus-Duntov was hoping to build 125 lightweight, high-power homologation-special Corvette Sting Rays so Chevrolet could qualify for the 24 Hours of Le Mans. GM smashed that plan to smithereens after Chevrolet had built just five of the so-called Corvette Grand Sports. All five were quickly spirited under the table off to legendary racers with last names like Penske, Foyt, and Hall. All five cars were raced without any factory support. Since then, Chevrolet has revived the Grand Sport name twice – once in 1996 and once in 2010. Both of those times, the badge meant special editions with beautiful bodywork, but no massive performance gain, unlike the 1963 Grand Sports. The 1996 Chevrolet Corvette ZR1 and 2010 Z06 would still outperform the Grand Sports. Of course, the 2010 Corvette ZR1 was still the most serious Corvette of that generation of Corvette. Of course, Chevrolet’s engineers went hog-wild with the C7 Stingray Z06. It’s a combination of a massively powerful engine that has been described as one of the best-sounding engines ever (I agree), absolutely brilliant suspension, and enough computing power to sequence the human genome. Yet, it’s so approachable for the average driver that it’s truly mind-boggling. It also costs around $80,000. It’s a true giant-killer, especially with a professional driver. Even without a professional driver, this is not a car you want to tangle with. The Z06 is also quite unlike the Corvette Racing C7.R that competes in one of the highest echelons of motorsports – endurance racing. The C7.R’s that quite simply walked away with the win at this year’s 24 Hours of Daytona actually make less power than the Z06 you can get on your dealership’s showroom floor. There’s no supercharged 6.2-liter LT4 V8 shrieking under the hood of the race-winning C7.R – those drivers have to make do with a 5.5-liter V8 sucking air through a restricted air intake the diameter of a garden hose. Because power is handicapped by a rule book (which didn’t stop NASCAR legend Smokey Yunick), the Corvette Racing team wins races with unworldly grip and highly aggressive aerodynamics. Let’s put it this way – their strategy works well. It’s interesting that the new Grand Sport, which is the mid-range model, lives up to the “street-legal race car” cliche. It’s got some of the best street tires in the world, aggressive aerodynamics enhancements, and stock engine. Oh, and it comes with a warranty, something most race cars can’t brag about. Let’s start off with the tires – Michelin Pilot Super Sports are standard tires, or even stickier Pilot Sport Cup 2s with the Z07 high-performance option package, which are the same tires you can get on the Z06. They’re much wider than the standard Stingray tires (40 mm wider up front, 50 mm wider out back), which means that Chevy had to put the Z06’s massive, bulging fenders to clear the massive tires. 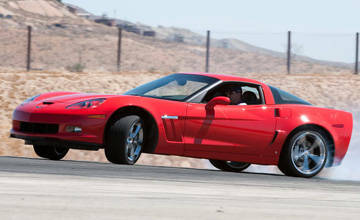 GM’s truly brilliant Magnetic Ride Control is standard equipment, as is the highly advanced electronic limited-slip differential, as are the Z06-derived chassis sports custom stabilizer bars and springs. You can pair the brilliant 460-horsepower, 465 lb-ft, dry-sump LT1 V8 with a fantastic 7-speed manual transmission or a pretty darn good 8-speed automatic, both of which come with the Stingray and Z06. What does the Z07 package add? Carbon ceramic brakes, and even more aggressive aero, mostly. Now, let’s move onto the beautiful bodywork. It’s mostly borrowed from the Z06 part bin. However, it’s got Grand Sport-specific front fender vent inserts. What about from the Z06? It’s got the Z06’s wider track (how far apart the wheels are from each other), an open-mouth front grille, and big differential cooling vents on the rear fenders. The Grand Sport has a Z06-spec front splitter, front splitters, and wickerbill rear spoiler, all of which are finished in carbon fiber in the Z07 trim. Chevy claims that they all create downforce, but the Z06’s clear plastic Gurney flip isn’t available on the Grand Sport. Oh, and then there’s a Heritage package, which adds the traditional front fender hash marks, which are now connected in a horseshoe shape. I somehow forgot to mention that Chevy has more than the entire rainbow’s worth of body, hash, and full-length racing stripe combinations. Inside the Grand Sport, there is badging depicting the 1963 Grand Sport #002 (the only roadster out of Zora Arkus-Duntov’s original five Grand Sports) on the floor mats, headrests, and on a dash plaque directly ahead of the shifter. The brushed aluminum halo on the right of the center stack has a subtle racing stripe, which is created by rotating the brushing pattern on the metal 90 degrees during the polishing process. Chevy says that the Grand Sport will hurtle it’s way to 60 mph in 3.6 seconds, and blast through the quarter mile in 11.8 seconds. I’m going to say that’s probably because the Grand Sport has much better tires than the Stingray does. 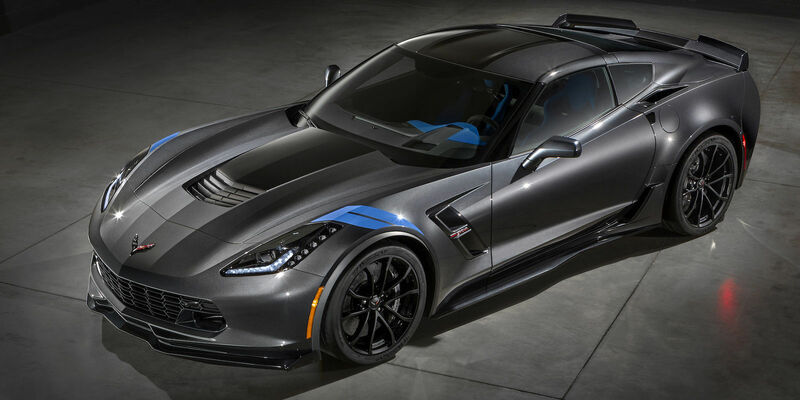 The Grand Sport weighs in at 3,252 pounds, which is 98 pounds lighter than the Z06. Because there’s no gigantic supercharger, the hood is lower, affording much greater visibility of the road. Even with the windows up, the A/C on full blast, and the engine contentedly burbling along at 1500 rpm in one of the Grand Sport’s many overdrive gears, you’ll still easily pull over 1 g without the car breaking a sweat. You won’t either. We’ll move onto the price now. The Grand Sport coupe starts at just a freckle under $66,500, which is a $5,000 premium over the Stingray. It’s also about $14,000 cheaper than a Z06. If you want to drop the top on any Corvette, plan to shell out an additional $4,000. Do you want the Z07 package? Give Chevy $8,000. Even if you buy the Grand Sport convertible with the Z07 package, that still gives you about $2000 to get some accessories, or haggling wiggle room. The Grand Sport does something truly incredible. Chevrolet designed this car to have the same absurd limits as the Z06, but never leave you feeling like it’s a waste of horsepower because you can never floor it. While grip, balance, and power all work together, which is what makes low-power sports cars so fun, they become magical when you turn the dial up to 11. 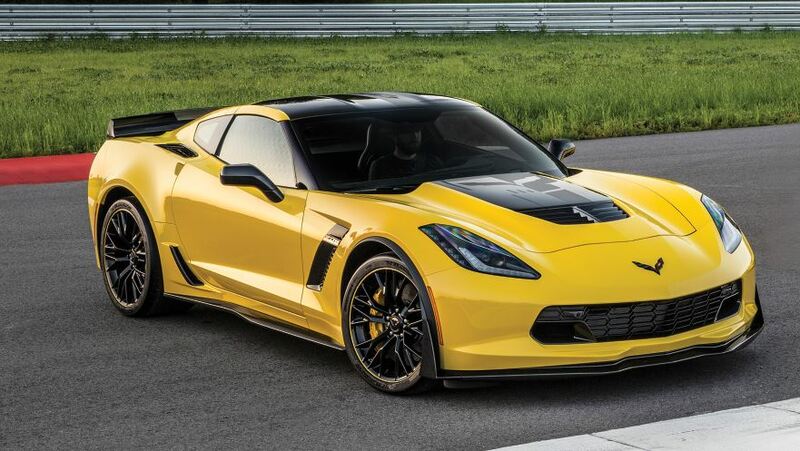 What would happen if you put the optional Z06-spec Michelin Pilot Sport Cup 2 tires to your Corvette Stingray Z51? It’s obvious that sticky tires are key to making a good car handle well. However, good tires won’t work as well unless the chassis and suspension are dialed into those tires. Even if you somehow figured out how to make those tires fit under a stock Stingray Z51’s seductive bodywork (remember that the Z06 is three inches wider in the back), you still would have a lot of work to do. The ABS system wouldn’t be properly calibrated. Stability control intervention would be much more sudden, and the brakes would slow you down almost instantly because the Z51’s brake calibration is designed for less sticky tires. That means it would apply more brake than necessary. The electronic limited-slip differential wouldn’t perform as well, either. The suspension would also be woefully undersized relative to the massive amounts of grip that the tires generate, which would make the car feel sloppy. What does this all boil down to? It’s more than a sloppy badge job, far more than a Corvette with some random Z06 parts, and more than a throwback to a legend. It’s the real deal, folks. This car isn’t tuned to within an inch of it’s life (and yours). This is a race car for the…wait, I don’t endorse illegal activities here. When you hear the word “Porsche,” what car do you think of? Of course it’s the 911. However, Porsche owes much more credit than it is given for the front-engine 944 and 928. Why’s that? In the mid-1970s, Porsche executives were imagining a vastly different future for Porsche than where it is now. The rear-engine 911, was in their eyes, a flawed and rapidly aging design. They started developing two front-engine cars to replace it. What were those cars? the 924 and the 928. My grandfather owned a 924 at one point, but that’s a story I won’t tell now. Anyways, back to the point. We all know that the future those Porsche executives had planned out didn’t happen. The 911 still remains in production, and is a true masterpiece of automotive engineering and design. However, the 924 and 928 played a vital role in Porsche’s storied history. The front-engine cars, especially the 944 , were the knight in shining armor for Porsche in the 1980s. They certainly stumbled with the slow, VW-derived 924, but they had a truly runaway success with the 944, which was what kept the 911 in production. In my eyes, it was unfortunate that the big, V8-powered 928 never really caught on with Porsche’s intended audience, but it has gained somewhat of a cult following in the past 15 years or so. While the 928, and 944 are dearly departed, their spirit lives on, albeit in a different form. The 718 Boxster/Cayman occupy the same space that the 944 did. One can make the case that the 928 was reborn as the Panamera. What about the 924? While it’s popular for budget track day enthusiasts, it never became as popular as the 928 and 944. Even though it had a VW engine, Porsche was in charge of developing the head for the engine. They played around with a 16-valve head, which meant it had four valves per cylinder (two intake, two exhaust), a turbocharger (which made the 924 quite formidable on a windy road), among other things. This is a 1976 Porsche 924. You can definitely see the VW design in it, right? The Porsche 944 was just a 924 with a bigger engine and better suspension. It was aimed at cash-rich, young professionals who wanted a nice sports car. It sold in droves. This is a 1991 Porsche 928 GTS. It had a V8, lots of power, and I think, might have been the ultimate iteration of the front-engine Porsche sports cars born in the mid-1970s. When Toyota started Scion in 2001, nobody expected it to do much of anything. It didn’t. Well, yes, the original xB was an all star smash hit, and the tC was a great combination of bulletproof reliability combined with an astonishingly low asking price, but everything else they did, let’s be honest here, was a massive flop. The 2001 xB was an excellent car. It was fun to drive, affordable, and instantly lovable. It was, in my eyes, the modern version of the original VW Type 1 Beetle. It was originally marketed towards Gen X, but everyone from teenagers to seniors bought it. It was just that kind of car. Every 10 years or so, there’s a car like that. It comes out of nowhere, sells like cocaine in the 1980s, and is fondly remembered by many. The “toaster,” as it was affectionately called wasn’t fast – it was far from it. It was safe, it had almost as much space as a minivan, thanks to its boxy shape and was easily customizable – from the dealer! It’s cute, right? I really love the original xB. Can you see why? Yes, you could walk into a Toyota dealership that sold Scions (I’ll get to that in a bit, I swear), and get a Scion xB, then go over to their customizing desk, and decide how you wanted to customize your xB, all within 20 feet of each other! There were so many options, you had to fill out a questionnaire so the customizing agent could help you out! The great part about this was that you could customize the car to your specific taste, not worry about voiding the warranty and walk out within two hours. The 2001 Scion xB was the car that kicked off the dealer accessory craze. It was a great marketing tool for many brands. Want a roof rack? You had a choice between Thule and Yakima, and between the two, literally 50 different roof racks to choose from. Want a wrap on your xB? The techs could slap it on in 20 minutes. The list goes on. All these accessories were affordable – you could walk out of the dealership with a Scion xB, customized the way you wanted it, with a good warranty, fully registered and insured, for $22,000. That’s what the appeal was. As I said, everyone from teenagers to seniors, and everyone in between bought the car. It shocked Scion’s marketing team, and even Toyota. Nobody predicted so many cars would be sold. Unfortunately, Scion failed to deliver with the second-generation xB. It had gigantic shoes to fill, but it had baby feet. It was heavier – almost 500 pounds heavier. It was more expensive; to the point that people walked over to the Toyota sales desk and bought a Matrix. It used to be that the Matrix was just a hatchback Corolla (the xB was too), but it was kind of like trying to differentiate between twins. The Matrix was cheaper, but it didn’t have the instant customizability that the xB had. The difference showed in sales – Scion still had all their repeat buyers, but the Matrix was just a better car overall. Buyers went to the Matrix, until Toyota killed it in 2013. Onto the tC. It was a perfectly fine car, but by no means was it on the same level as the Mazda 3 or the Honda Civic. The build quality was great, no doubt about that. It just left something to be desired. But, it was cheap. Dirt cheap. That’s why every 8th car you see on the road is one. Well, maybe not that many, but it sure seems like it. It wasn’t as easily customizable as the xB, but it certainly had it’s benefits. It was cheap enough for those starting to get into the automotive scene to modify it like no tomorrow, but drive it to school or work every day. The Mazda 3 could do that too, but was more expensive. It was also marketed towards college students and above. 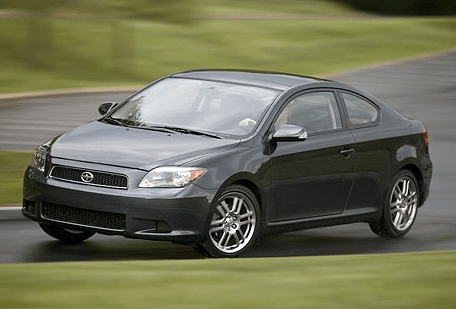 The original Scion tC was a smash hit. The second generation wasn’t as wildly popular, but it certainly sold a lot. Let’s talk about the stupidity of selling Scions next to Toyotas that were similar in price. Seriously, who at Toyota, when they were planning Scion, thought that was a good idea? It’s like selling candy bars next to each other. You can’t choose the right one. That’s what happens when there are too many options. Scion sales would go sky-high for a couple months, then Toyota compact car sales would overtake them like you wouldn’t believe. It was just a constant game of tug-of-war. Imagine walking into an Armed Forces recruitment center, with all the recruiters standing there, all trying to give you “the best deal you’ll get.” The truth is, they all offer the same thing, but they disguise it well. Just choose the one you like best and the others will find somebody else. This was Scion’s ultimate downfall in my eyes. They simply couldn’t compete with the elephant in the room. Yes, they had other problems. Their other cars were practically carbon copies of Toyotas. Why buy a Toyota Yaris hatchback when you could buy a Scion xD? The Yaris was cheaper, and had essentially the same things going for it. The xD had a bit more power, but the Yaris at least looked halfway decent. The xD looked like someone chiseled a block of concrete with an ax, slapped wheels and a price tag on it, and pitched it to Scion. 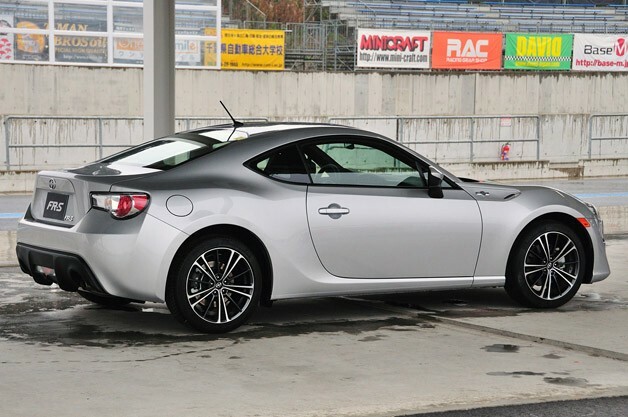 What might have been the best car Scion made, apart from the 2001 xB, was the FR-S. It was cheap, which was Scion’s main selling point. It was an incredibly fun car to drive, and the perfect one for the budding autocrosser or track day enthusiast. It’s biggest downfall is that Subaru and Toyota sold the exact same car, but with different badges. Yes, I know it was badge engineering, but why buy the Scion when you could buy the Subaru? That was the dilemna many prospective owners faced. It offered more utility and just as much fun as the Miata, but it was a price difference of $2000 between the Scion and the Subaru. So, what was Scion’s downfall? Poor sales after the redesign of the first-generation xB, offering similar, if not identical products, and no dedicated dealers. Will I miss Scion? Yes. I will miss the magic that the 2001 xB brought to the automotive world, the affordable performance the FR-S brought wailing and burbling into the automotive world, the instant and easy customizability that any Scion brought, and the ferocious sibling rivalry between Toyota and Scion. Will Scions keep their value? Who knows. Only time will tell. The resale value of the 2001-2007 xB has certainly held up, and likely will for a while. They are cheap, but the price hasn’t gone up or down, like most cars. The tC, a fantastic car in it’s own right, may hold up. It’s hard to tell with that one. The FR-S? Maybe, maybe not. It was a worthy Miata competitor, but it’s identical siblings, the Subaru BR-Z and Toyota GT86 (non-North America markets only), will still be in production. I am saddened that Scion couldn’t clean up their act, but they obviously weren’t competitive. Their market went away. They had a nice run though, and there are certainly other choices. Some of the Best Cars with V10s Around! They have a great engine note. They have a lot of power. They come in sizes ranging from relatively small to large. Here are some of the best you can buy. 2009 Audi R8 5.2 FSI Quattro: The V8 version of the R8 came out in 2008. It was stunningly beautiful, and offered great performance at a reasonable price. The 5.2 FSI Quattro version added two more cylinders, 105 more horsepower, and even better looks. The 5.2-liter V10 was a slightly-detuned version of the Lamborghini Gallardo’s V10. 2005 BMW M5: The early 2000s were an era when manufacturers could shoehorn massive engines into big sedans without complaint. The 2005 BMW M5 is a relic of that era, and boy is it a good one! It bellowed and roared up to a redline of 8,250 RPM. This 5.0-liter V10 was derived from Formula 1, which is why it sounds so damn magnificent. 2006 Audi S8 5.2 FSI Quattro: This might be one of the ultimate sleepers. This big sedan is a beauty, but it’s a fast one. It got to 60 mph in a scant 4.8 seconds. The magnificent trim inside and out, plus the everyday utility of a large sedan made this quite possibly the best balance between work and play. 2006 Dodge Ram SRT-10: Need I say more than it was a truck that put down 500 horsepower stock? No, I don’t. Oh, and it’s engine came straight out of the Viper. 2003 Lamborghini Gallardo: The first baby Lamborghini was an absolute sweetheart. It was also the car that really saved the brand. It was an Italian beauty with a German heart. The engine started out as a 5.0-liter V10, but ended up as a 5.2-liter V10. It also spanned 10 years. It birthed countless iterations and special editions, while becoming a tuner favorite. 1999 Dodge Viper ACR: It had one of the biggest engines available when it came out, and that engine is still one of the largest around. It sounded more primal than mechanical. It sounds like a dinosaur fighting Slash. Yes, I know, I love to bash Slash. 2011 Lexus LFA: It doesn’t matter that this was a terrible supercar. It sounded like nothing else. Lexus teamed up with Yamaha’s musical instrument division, who tuned the engine note like a guitar. That would explain why it sounds godly. It was described by Lexus engineers as “the roar of an angel.” I think it sounds more like the roar of Satan. 2011 Volkswagen Touareg V10 TDI: It must be a good life to be a diesel V10. Good enough for U.S. emissions regulations to cancel sales on our shores twice. Yeah, twice. Thanks Uncle Sam. That being said, it had twin turbochargers force-feeding air into those 10 hungry cylinders. 2004 Porsche Carrera GT: Where do I start with the “Widow-Maker?” I don’t know. Yes, it has killed people, notably Paul Walker and Roger Rodas, but that was more user error than anything. This car can trace it’s heritage back to Le Mans and Formula 1 cars. That engine note is out of this world. It reminds me of the Bad Company song “I Can’t Get Enough of Your Love.” Except this is I Can’t Get Enough of Your Engine Note. Racing is in America’s blood. We started off racing horses, which is still one of the most profitable forms of betting to this day. We also love boat racing, whether it be sailboats or motor boats. We also love racing planes. It should only seem logical that we decided to race cars when they came out. Our country has created some of the boldest, most successful and boldest racecars in history. These cars are some of my personal favorites, and they only scratch the surface of America’s storied racing heritage. Chaparral 2E: Chaparral’s 2D was a very successful racing chassis, the 2J earned immortality thanks to it’s snowmobile-engine-driven suction fans. The 2D was better than both combined. It ushered in the aerodynamics era thanks to it’s driver-adjustable rear wing (which was adjusted via a pedal in the cockpit) and it’s side-pod mounted water cooling system. It was pure Texan ingenuity. Every modern race car owes at least something to the Chaparral 2E. 1967 Gurney Eagle-Weslake Mk. 1: Dan Gurney was a true American racing pioneer. This is what I view to be his masterpiece. He also won a Formula 1 race in this car. That’s about as good as it gets, but I still love this car to pieces. The tiny 11,000 RPM V12 and styling that looks like a shark and torpedo are just icing on the cake. Lotus 56: It’s not just another turbine-powered IndyCar. It was a car that solidified the basic shape of most high-level race cars from 1967 on out. It sent the cigar shape packing. It also had a one-speed automatic and AWD. While turbines and AWD would be banned from future IndyCar seasons, the shape remained and evolved. Even though it’s got a Lotus name and Peter Chapman modifications, it’s still basically an all-American STP-Paxon car. 2016 Ford GT GTE: There was no doubt in any car or race fan’s mind when this car rained on every other car’s parade at the Detroit Auto Show this year. It’s 3.5-liter EcoBoost V6 has been proven in the TUDOR Championship series, Chip Ganassi Racing has had lots of success racing Fords and is ready for a new challenge, and what might be most important to those automotive fans who like to cook (like me) is the fact that the rear diffuser is big enough to chiffonade an acre of potatoes without trying. The fact that it is dressed up in a very patriotic livery makes it just that much more amazing. Dodge Viper GTS-R Mk. 1: The original Dodge Viper GTS-R immediately proved that a big V10 is an essential asset in endurance racing. On it’s third outing at Le Mans, the SRT Motorsports team took a class win in 1998. Again in 1999 and 2000. You can’t forget the overall wins at the Nurburgring, Daytona, Spa, and the five (yes, five) FIA GT and two ALMS championships. Plus, the fact that it was incredibly intimidating helped. Corvette Racing’s C5.R, C6.R, and C7.R: For 17 years, The Corvette Racing team has put three generations of increasingly amazing Corvette race cars on the track. All have had an “.R” designation, except the first, which was a “-R.” They have proved themselves multiple times. 1999 marked the first year of the C5-R, which snatched three class wins at Le Mans (among many other wins). The C6.R took seven thundering liters of American muscle around the world, and won many races. The C7.R just grabbed the GTE Pro class win at Le Mans, and that was one of it’s first races! Panoz LMP-1 and LMP07: Many, many years before Nissan’s GT-R LM caused folks to scratch their heads as to why a front-engine endurance race car is a good idea, Panoz’s LMP-1 Roadster S and it’s less successful sibling LMP07 proved to the world that an endurance racing prototype does not need to carry their engine behind the driver. Neither car was wildly successful, but the LMP-1 certainly got into a few good battles with the BMW V12 LMRs and Ferrari 333 SPs to snag the 1999 ALMS team championship. Ford 999: Henry Ford should go down in the history books as a stark raving lunatic (for several reasons) because he took the crude, incredibly dangerous 18.9-liter Ford 999 racecar to 92 mph (the equivalent of somebody taking a car to 300 mph today) – a world record – on a frozen lake. The frozen lake was the only place large enough to get the car up to that speed. It made a whopping 80 horsepower, a lot of noise, and had killed a man a year before. It was a brutish, outrageous car that put Ford on the map, even if he became known for utilitarian and economical Model T’s and the now-legendary 1932 Ford. DeltaWing: No other American creation has so upset the normality of what race cars should look like as the Ben Bowlby-designed, Panoz-managed, Gurney’s All-American Racers-built DeltaWing. The car drastically reduced frontal area to reduce drag and fuel consumption. It worked, and even sparked a copycat (the Nissan ZEOD RC), even though it didn’t achieve any incredible success. Cadillac ATS-V.R: Cadillac attained massive success for ten years with the CTS-V.R in the Pirelli World Championship Series. Now it’s the turn for the ATS-V.R to take the reins. It’s got some big shoes to fill. It’s got a twin-turbocharged 3.6-liter V6 making somewhere around 600 horsepower that sits somewhere between the massive fender flares and the huge extractor hood. Between this car and the Ford GT GTE, it looks like most, if not all, future American race cars will have forced induction engines. Swift 007.i: The year 1997 was a lucky year. The team owned by Paul Newman and Carl Haas stopped running a Lola chassis, and switched to a chassis made by the American company Swift. The car had a Ford Cosworth engine, Goodyear tires, and an all-American driver in Michael Andretti. I should probably mention that it won it’s first-ever race outing. Talk about coming in with style. Oh, and I was born that year. Shelby Cobra Daytona Coupe: This is quite possibly one of the most beautiful cars ever made, as well as one of the most successful. Carroll Shelby needed to make the already-successful Cobra 427 faster, but that meant he needed a more aerodynamic body. He brought on legendary designer Peter Brock, who helped design the 1963 Chevrolet Corvette Stingray. Brock designed a flowing, muscular body that still looks like nothing else on the track. The result was a smashing success. The car won the 24 Hours of Daytona, Le Mans, Spa, and countless other races. Dodge Daytona/Plymouth Superbird: Mopar’s “Winged Warriors” made aero cars illegal in NASCAR. That should be telling as to how good those cars were. They packed quite the punch with their 426 HEMI engines and special aerodynamics packages. NASCAR outlawed aero cars after 1970. Buddy Baker campaigned a Daytona through 1970, and Richard Petty had one of his most dominant years in 1970 with his Superbird. It’s also one of the most iconic race cars ever. 1966 Chevrolet Corvette: The 1966 Chevrolet Corvette is one of the best race cars Chevrolet ever had. It had a walloping punch with it’s 427 cubic-inch big block V8, with the code-name L-88. This engine made any car it was in a true monster. It’s still fast enough to show a modern NASCAR stock car how it’s done on a road course. It’s like carving a statue with a hydraulic shovel. Lamborghini is perhaps best known for it’s screaming V12-powered supercars that seem to defy physics. Here’s how these screaming machines have evolved. 1966 Lamborghini Miura: The first Lamborghini supercar was the Miura, which debuted in 1966 at the Geneva Motor Show. It was the first of the big Lamborghinis. Of course, the big ones are the ones that scare you just by unlocking them. That’s how you know a car is fast. The Miura made 350 horsepower, which was more than enough to move a car that weighed under 3,000 pounds. It’s one of the most captivating designs of the 20th century, especially in red. 1969 Lamborghini Miura S: It was basically a facelifted Miura with an extra 20 horsepower. Oh, and Miles Davis crashed one when he was high on cocaine. A man very revered in the racing world, James Glickenhaus, pulled the high and bloody Davis out of his totaled Lamborghini. 1971 Lamborghini Miura SV: The final iteration of the Miura brought the power up to a then-absurd 385 horsepower, and lost the frilly eyelashes that previously surrounded the headlights. Lamborghini also came up with what was then a novel idea, splitting up the lubrication for the gearbox and transmission. This was the best iteration of the Miura. The most power, lightest weight, and all of the kinks were ironed out. 1974 Lamborghini Countach: The curvaceous Miura was replaced by the blocky Countach, a car that looks like it was designed by a high school geometry student. It was a good car, but it was not without it’s flaws. Visibility was like looking out of a concrete bunker 50 feet below the ground. Another complaint was that the car was a much better pinup than it was a car. Just about every boy in the 1970s had a poster of a Lamborghini Countach hanging on his bedroom wall. The first version of the Countach had no massive wing and 370 horsepower. 1978 Lamborghini Countach LP400S: The LP400S lost 20 horsepower, but it also got wider wheels. The 1974-1977 models had skinny little wheels and tires that had no grip to them. That famous gigantic rear wing was an option that looked super cool, but cost you 10 mph. 1982 Lamborghini Countach LP500S: Just about the only change to the 1982 version of the Countach was the introduction of a 4.7-liter V12. 1985 Lamborghini Countach LP5000 QV: This is my dream Countach. The engine was a 455-horsepower 5.2-liter V12. Interestingly enough, when Lamborghini switched from carburetors to fuel injection on the very same engine, horsepower dropped to a still-impressive 414 horsepower. 1988 Lamborghini Countach 25th Anniversary Edition: It was mechanically identical to the LP5000 QV, but it had a body that Horacio Pagani (yes, that Horacio Pagani) redesigned. It was a love it or hate it design, and most people fell on the side of hate. I don’t know why. It’s still blocky, but it’s a good looking car. 1990 Lamborghini Diablo: Marcello Gandini started the design, and Chrysler’s Tom Gale finished it. It had a 5.7-liter V12 cranking out 492 horsepower. It’s top speed was a then-diabolical 202 mph, which exceeded the initial target by six mph. It didn’t come with power steering. I’m not sure I’d want to go 202 mph in a car with no power steering, especially with no electronic nannies to save me. 1993 Lamborghini Diablo VT: The Diablo VT was the first AWD car from Lamborghini. It could send up to 25 percent of it’s power to the front wheels, which drastically helped it’s traction. It also had redesigned intakes to improve cooling, a new interior, and various cosmetic changes to differentiate it from the “base” Diablo. 1995 Lamborghini Diablo SV: The SV was supposed to be the most diabolical Diablo out there. Because of this, it had 510 horsepower and RWD. It was also the cheapest Diablo available, which really doesn’t make sense. Yes, those wheels are stock, and super cool! 1995 Lamborghini Diablo VT Roadster: It’s exactly what it sounds like. It’s a Lamborghini Diablo VT with an electric folding carbon fiber top. Power went up to 530 horsepower for 1998. 1999 Lamborghini Diablo: The 1999 model was the first year that the Diablo didn’t have pop-up headlights. Instead, the SV model, which was the base model, had the same headlights as the Nissan 300ZX. I’m not joking. It also got a new interior, ABS, and power was now at 530 horsepower. The Diablo VT got the same upgrades. 1999 Lamborghini Diablo GT: Talk about absurd. The Diablo GT was basically a race car for the road. It was stripped down, the bodywork was substantially different from other Diablos, and it had a new 6.0-liter V12 making 575 horsepower. It was incredibly fast. Looks can be deceiving. It might look somewhat similar to the 1995 SV model, but it is very different. 2000 Lamborghini Diablo VT 6.0: The final iteration of the Diablo got a redesign that made it look much smoother, thanks to Audi’s purchase of the company. The more subdued design, coupled with the engine from the Diablo GT made it a much better car to drive and look at. 2002 Lamborghini Murcielago: Yes, I know that it means “bat” in Spanish, but it is still a very intriguing car. Don’t let the name get to you. It was the first V12-powered Lamborghini to be designed and engineered in-house. It had 572 horsepower, and was only available with AWD. It also made extensive use of active aero and active cooling to keep the exterior of the car relatively clean-looking. It was also the first time that an automated manual transmission was offered in a Lamborghini. A roadster followed in 2004, with an overly complicated manual roof. 2006 Lamborghini Murcielago LP640: The big Murcielago now made 632 horsepower from its 6.5-liter V12, and it had a slightly revised body. Carbon ceramic brakes were an option, just in case you really wanted to show how well your supercar could stop. 2008 Lamborghini Reventon: The Reventon was essentially a rebodied Murcielago LP640. It was inspired by fighter jets, and as such, had creases and angles galore. It had an interior like a fighter jet cockpit, which meant it was extremely cramped, but it had a unique TFT display, instead of analog gauges like the Murcielago. Lamborghini only built 21 coupes and 15 roadsters. 2009 Lamborghini Murcielago LP670-4 SV: The fastest Murcielago ever to leave the Lamborghini factory doors was the LP670-4 SV. It had 661 horsepower, a heavily revised body, a stripped interior, and came standard with a massive wing. The wing limited it’s top speed to 209 mph. The optional smaller wing brings the speed up to 212 mph, but also provides less downforce. You could get it with either the clunky automated manual or a true six speed manual. I really want to have one with the big wing and the six speed. Help me find one! How can you not want something like this, especially when it reeks of awesome? 2012 Lamborghini Aventador: The Aventador picked up where the Reventon left off. It’s all creases and angles, and is one of the most intimidating-looking cars in the world. The 6.5-liter V12 pumps out 691 horsepower, and sends power to all four wheels through one of the worst transmissions ever. It can never replicate the same shift. You either get shoved back into your seat, or you get an imperceptible shift. For something that costs so much, it should have a good transmission. A roadster is also available. 2013 Lamborghini Veneno: Like the Reventon, the Veneno is another extreme styling exercise. Lamborghini really went all out this time in terms of design and price, as the car cost upwards of $4 million. There are four coupes (one is in the Lamborghini museum), and nine roadsters. The styling might be quirky, but the performance is not. 2015 Lamborghini Aventador LP750-4 SV: This might very well be the ultimate Aventador. It’s certainly the fastest. It proved itself by going around the legendary Nurburgring racetrack in 6:59. It’s just seconds off the Porsche 918 Spyder’s lap time of 6:57. The SV has 750 horsepower, AWD, heavily revised aerodynamics, and is 110 pounds lighter. And yes, Lamborghini has confirmed that they will make a roadster version of it. And there you have it. The latest in a long line of high-performance cars. This is the most diabolical, yet civilized of them all. It’s certainly one of the most iconic automotive designs ever. I’m sure that if you named just one thing about one of the air-cooled Porsche 911’s, it’s been written about. While being in and around the car is like watching a movie you’ve seen multiple times, it still has that mystical allure that reels you in each time. Seeing the car is an experience that is hard to forget. It’s probably because you can’t compare the design to any other car on the road. It’s incredibly and undeniably unique. Yes, it’s got a hint of VW Beetle and the Porsche 356 that preceded it, but we tend to forget those cars when we see one. The car was designed to carry four adults and their luggage around in comfort and style, yet be fun to drive. Most “true” sports cars only have two seats, yet the 911 has four. This is odd, but somebody high up at Porsche presumably wanted something that could carry more than two people. Unless they wanted to make it incredibly long, the engine would have to be behind the rear axle. However, this isn’t the universally-accepted truth. The idea that Porsche is wedded to the engine-in-the-back philosophy is one that you could seriously consider. The 911 was preceded by the mid-engine 550 Spyder, then followed by the mid-engine 914, the front-engine 924 and 928. The purpose-built racecar built by Porsche in the same era, the 904, was mid-engine. The car that truly preceded the 911 was the rear-engine 356, which was essentially a rear-wheel-drive VW Beetle with a nice interior. For all essential purposes, the 911 is the second and final Porsche rear-engine design, redone a few times. Even the 356 began as a mid-engine car. This rear seat thing is why the driver sits higher than most other sports cars. It allows their legs to be slightly more bent, which gives more space to the folks in the rear seat. This is also what makes the roof so tall, as well as how far forward the windshield goes. It’s flat-six engine is only three cylinders long, so the rear overhang is no longer than most front-engine sports cars. But, it’s also significantly lower overall than most other sports cars. Most people rail on the car because of it’s rear-engine location, but the truth is, that’s not the most interesting part of the design. They should focus more on the tall and forward-positioned windshield, and the single sweep backwards to the tail end of the car. The original Porsche 911 was a massive 15 inches shorter than the Jaguar E-Type, which is really the only comparable car in terms of cabin space and performance. In short, the 911’s proportions are more to do with the fact that it was designed to carry two people in the back, rather than having the engine in the back. The real allure of the 911 for me is the fact that Porsche placed function over form, yet created an intensely beautiful and unique car that nobody else was capable offering. It is utterly unique, and nothing can quite compare to it. The interior is nothing special, but there’s something beautiful and understated about it. It’s very simple, but owners say that the car is far from basic. The car may be small, but it’s far from cramped. There is something that draws me to the surprising compactness of the original 911. It’s actually a small car. While I know that modern cars have grown substantially, the original 911 is about the same size as a stock 1930 Ford Model A. It’s really not a big car, yet it’s got an impressive amount of utility to it. I really want to drive one, or at least ride in one. This is the infamous Porsche 550 Spyder. James Dean died in one. Most racers in the 1960s got started in either an MG or a Porsche 356, both of which dominated the road racing circuit for many years.